I always used to love cooking, way before diagnosed, and am not ashamed to admit that I was scared to make a risotto. When I moved here, I had it many a time in restaurants as I so love it, so I decided that I HAD to learn how to make a proper risotto. After a couple of times, you do master it, trust me. When making a risotto, you need some patience, you cannot just leave it to cook on its own like when you boil rice, you need to keep adding ladle after ladle of simmering stock to it. Sometimes, I do not just use ready made stock on its own, but I also add some fresh celery, onion etc to the stock if I use vegetable stock, porcini if making a mushroom risotto or prawn shells if a fish risotto. These additions would make a better tasting stock. Also, remember a risotto should not be dry. but saucy. I once read that “a risotto should flow like lava when the plate is tilted”. 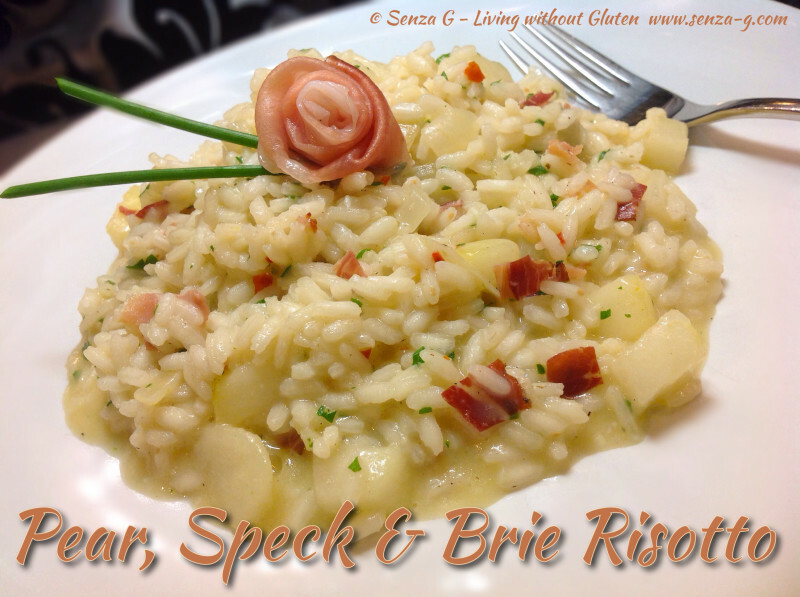 This particular risotto was made by Giancarlo, a Chef in a restaurant here that we often go to. I loved it so much that I decided to make it, with a few changes and share it with you. Sauté the onion in a little olive until transparent. Add the speck and cook for a couple of minutes. Add the rice, stirring until it is covered with the oil. Add the wine which will be absorbed almost immediately. Stir in the minced garlic and add a ladle of stock. As soon as the stock looks almost absorbed, add another ladle and stir. Continue adding a ladle at a time till the rice is tender. Stir in the pear cubes. Do not let the rice dry out. It should still have a little stock. Add the Brie cubes, the parsley, a knob of butter and a grinding of nutmeg. Stir well until combined. Cover and leave for a few minutes to rest before serving. Serve garnished chives and with the extra speck rolled into a rose.